Festival of traditional music, dance, craft, dialect, heritage and family fun – held the weekend after Easter in Northumberland’s historic county town of Morpeth. Special Ower the Watter! themed events celebrating the area’s international musical links. All details subject to change - see noticeboards at the Town Hall and around the town, Facebook or Twitter for any last minute cancellations or alterations. 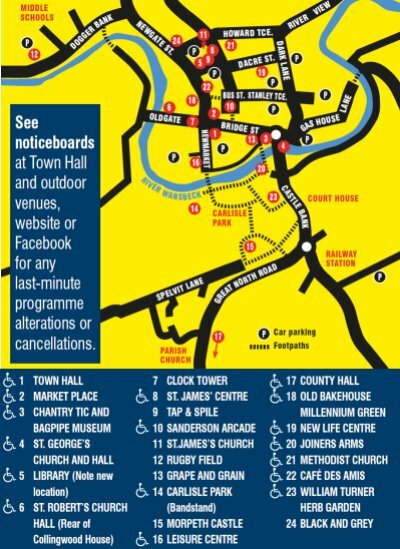 All venues fully accessible except Clock Tower, Castle gatehouse, Grape & Grain, Tap & Spile. 1st price waged adult; 2nd unwaged; any 3rd price for school-age child; under 5s free. At some free events donation boxes will be passed around. There are no weekend tickets except through our advance Patrons Scheme. Tickets on sale in advance from Chantry and during the Gathering at the Town Hall Festival Office and event venues. Car parking – town centre parking is free but requires a £1 disc available from shops and public buildings. Free park and ride from County Hall Saturday only. for adults (over16) with Dave Shaw. NB Fully booked. NB – some venues are changed from previous years. Extra changes may be required in the event of bad weather or unexpected venue problems. Beware of the hour-long road closure for the Pageant on Saturday morning! First Aid – St John Ambulance will be located in the Newmarket car park behind the Town Hall on Saturday. Park Toilets – closed; please use facilities at Leisure Centre, Electric Wizard, Rutherford’s, Sanderson Arcade, the Bus Station, or the Terrace car park by St George’s. Border piper, flags, Lord Greystoke’s return from 1388 Battle of Otterburn, costumed groups, bands, dance teams, the Durham Dragon and Twisting Ducks, giant figure of piper Jamie Allan, welcomed at Town Hall by the Morpeth Gadgy and civic leaders. During this time (10.30 - 11.45 am) Market Place & town centre from Chantry to Manchester Street closed to traffic. Alternative route Dark Lane/Stanley Terrace/Wellway. Saturday Competitions: Passport ticket for entrants/audience £2.00/£1.50 includes free entry to Exhibition. Doors open 30 minutes before times stated below to allow entrants to register. with Beeswing. Event dedicated to the memory of Ken Self. Special guest Scottish superstar Brian McNeill celebrating 50 years in folk music. Plus 2018 open music and dialect winners including the Redheughers, Iain Gelston, Carl Stiansen, Wallace Calvert, Eileen Beers, Edric Ellis, Marina Dodgson and Vivien Kent, Graham Bell, and 3-times champion fiddler Ali Say. with Fiddler's Elbow and guest dance spots including Newcastle Royal Scottish Country Dancers. Bring own drinks; no stiletto heels! Park Toilets – closed; please use facilities at Leisure Centre, Sanderson Arcade, Electric Wizard, the Terrace. Morpeth Northumbrian Gathering Committee is a standing committee of Morpeth Antiquarian Society (Reg. Charity No. 507640) and a member of the Association of Festival Organisers. MNGC reserves the right to alter programme details. Morpeth Gathering is aided by individuals and organisations including in recent years: Anonymous, N Bettinson, V Bradford, O Brodie, C Caisley, S Clarke, H and P Crook, P Dunn, R Forster, Freeman Family, Friends of Morpeth Museum, John Gerard, D and D Girard, Greater Morpeth Development Trust, Grosch-Miller Family, FH Hardy, E Hogg MBE, J Homer, C M Houlton, Landmark Trust, Longhorsley Parish Council, Morpeth Antiquarian Society, Morpeth Art Group, Morpeth Chantry Bagpipe Museum, Morpeth Clock Tower Bellringers, Morpeth Lions, MorpethNet, Morpeth Rotary Club, Morpeth Town Council, Morrisons, Museums Northumberland, NE Vintage Buses, Northumberland and Tyneside Orienteering, Northumberland County Council, NCC Chairman’s Fund, Northumbrian Language Society, Northumbrian Pipers’ Society, Old Bakehouse Millennium Green Trust, Pegswood Parish Council, Records of Early English Drama NE, P and P Rescigno, Robson and Prescott, N Short, J Shurlock, Stait Photography, R Stewart, A Swailes MBE, C Telford, A Tebbutt, Trailer Trash, H Trueman, JA Turnbull, Tyneside Fiddle Alliance, Ulgham Parish Council, Wellway Accountants.